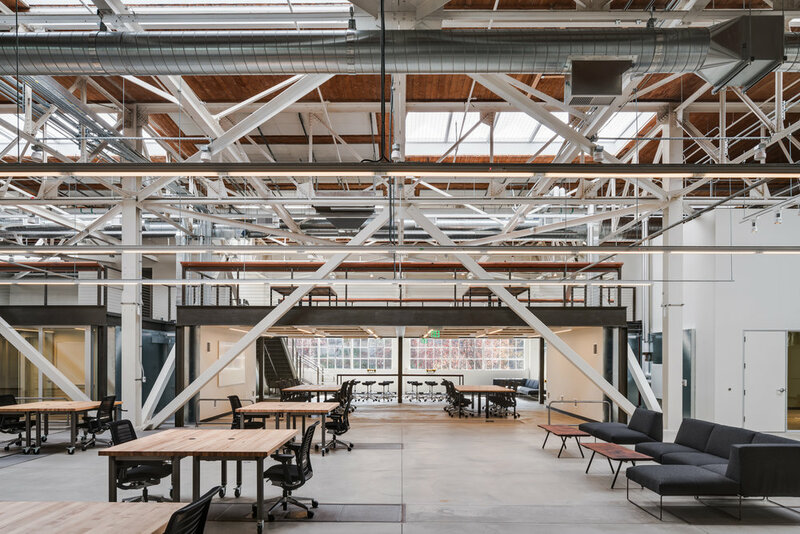 A 1920s can manufacturing facility in San Francisco's up-and-coming Dog Patch neighborhood was the blank canvas for this pared-down yet comfortable office design. (Fitting for the caffeine-fueled denizens of any modern Bay Area workplace, the factory was originally used to churn out cans for Folger's Coffee). 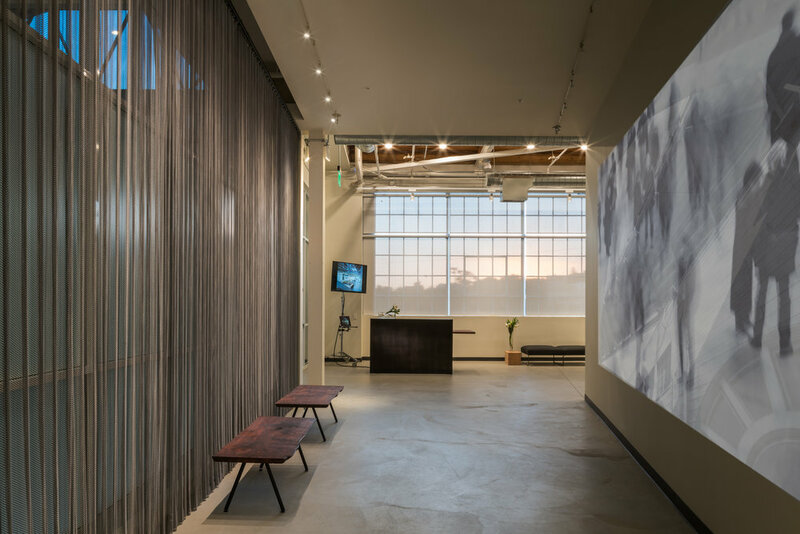 Rather than working against the drawbacks of an older, formerly industrial space, we centered our design process around building-informed decision making, driven by expert analysis of the space's unique thermal, acoustic, and lighting needs. By analyzing the weak points of the building's leaky thermal envelope, we set working areas back from the glassy perimeter (prone to heat loss) and anticipated late-night deadlines with a hidden radiant floor that maintains occupant comfort during nighttime temperature drops without the cost and energy burden of heating the entire 20-foot volume of space. Acoustic sound-absorption panels are hidden amidst ceiling beams so the airy feeling of the space remains uninterrupted, while ample existing skylights nearly eliminate the need for electric lighting during the day. 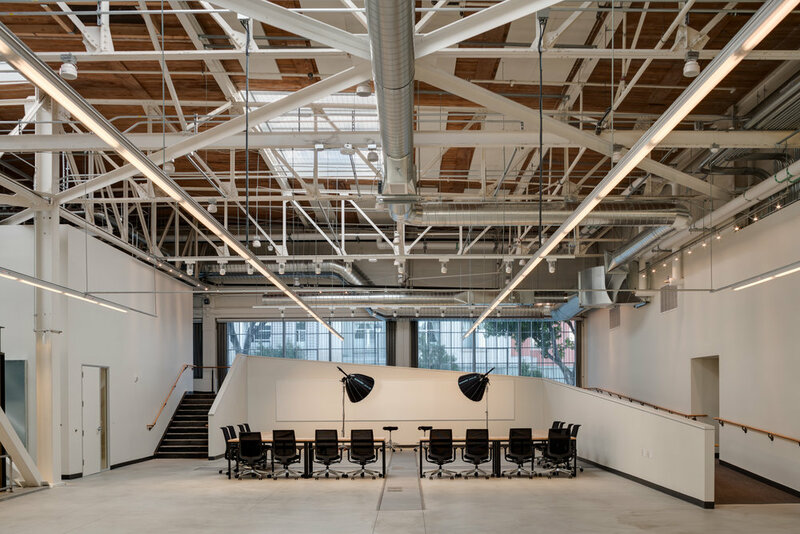 We subdivided a large portion of the space into a two-story mezzanine, with the dual benefits of adding extra square-feet of workspace above while holding mechanical systems, conference rooms, open seating nooks, and bathrooms below. In keeping with the client's desire for all employees—regardless of gender or physical ability—to have a dignified experience of the workspace, all bathrooms in the space are single-occupancy and gender-neutral, while the mezzanine is accessible by an ADA-compliant ramp wrapping around its exterior perimeter. Anticipating the client's evolving needs for more or less square-footage devoted to private offices and meeting rooms, the conference rooms' glass walls can be easily moved and reconfigured to accommodate multiple layouts. 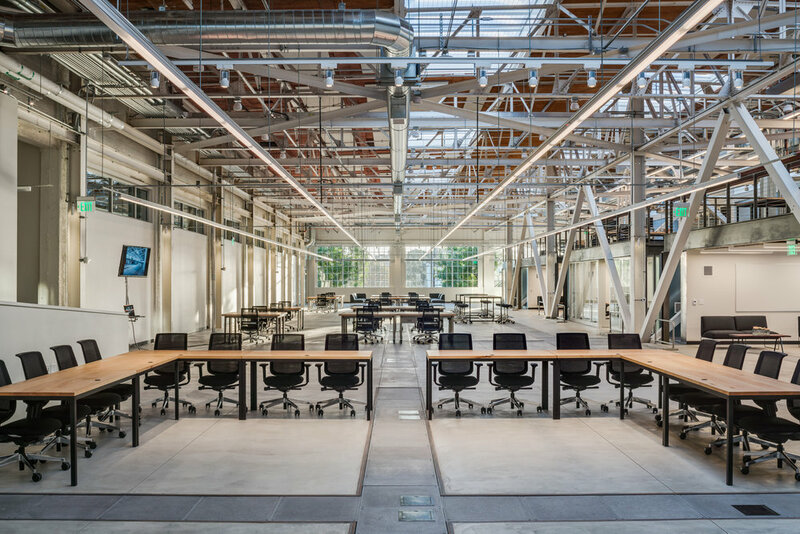 Likewise, the radiant floor slab in the open-plan office space is equipped with a flexible grid of embedded power and data so desks—themselves mounted on rolling casters—and seating areas can be rearranged on a whim. By integrating complex systems into sleek and often invisible solutions, the result is a space that appears simple and elegantly inevitable. We partnered with Devcon, a local contractor, to execute the project. This approach allowed for a dialogic design/build process in which subcontractors acted as stakeholders and expert consultants throughout the project's design and construction. As the leader of an interdisciplinary design team, we were able to glean insights from those with specific knowledge bases and tailor the resulting design to the building's unique needs. We have since partnered with Devcon on another large-scale office building that is currently under construction in Northern California. Acoustical Design: Charles M Salter Assoc. Inc.